L-R, top - Dr. Matthew Noble, Dr. Benita Muth, Dr. Don Brown. L-R, bottom - Liz Travis, Janel Carmel, Shaun Bohannon. 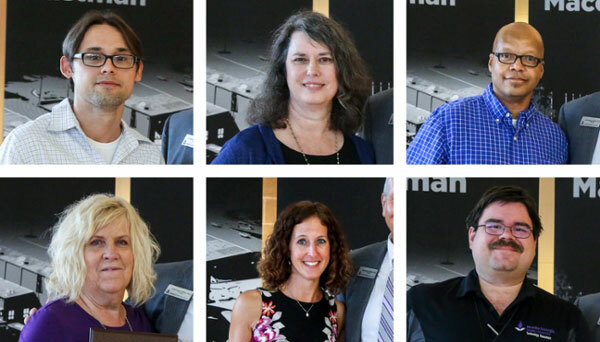 Six Middle Georgia State University (MGA) faculty and staff members were recognized at the annual Fall Convocation for outstanding achievements. Dr. Matthew Noble, assistant professor of math, won the Outstanding Scholarship award. In four years at MGA, he has published a much greater than average number of articles about his specialties, combinatorics and number theory. Dr. Benita Muth, associate professor of English, received the Outstanding Teaching award. Known for mentoring students and for her inspirational teaching style, Muth has also won the National Society of Leadership and Success Excellence in Teaching award. Dr. Don Brown, associate professor of math, received the award for Outstanding Service. Among many other things, Brown coordinates an initiative designed to reduce the cost of course materials for students. Outside MGA, he serves on the boards of the Macon Film Guild and the Ocmulgee National Monument Association. Liz Travis, admissions specialist, received the Service Excellence award. In more than 30 years of working at MGA, Travis has earned a reputation for going the extra mile to help students get enrolled and being willing to help her colleagues from other departments. Janel Carmel, administrative assistant, received the Unsung Hero award. Even though her primary duty is back-office processing for the Admissions and Recruitment office, Carmel is known for working with students one-on-one to help them with enrollment related issues. Shaun Bohannon, assistant director of IT Services, received the Champion award. Bohannon is known for how well he assists colleagues with technical issues. He often gives colleagues his personal cell phone number and invites them to call him at home on weekends if they need help with an IT problem.